These stats are more advanced than the stats explained in the beginner poker HUD stats article. Intended for use by intermediate players who require more information on their opponents! This stat tells us how often a player will fold when facing a 3bet. We can use this stat to determine which players to 3bet steal against and also narrow their range when they continue v a 3bet. If a player has a high ST and high Fv3b we can assume they are stealing a lot and we can 3bet steal with a higher frequency. If a player has a low Fv3b stat it can mean they call 3bets light or their initial opening range is far more value orientated than we first thought. We can use the 4B in conjunction with this stat to see the frequency a player calls our 3bet and the frequency they come back over the top with a 4bet. This will give us an idea of their calling range and 4bet range. These stats tells us how often a player 4bets when facing a 3bet, 5bets when faces a 4bet and so on. As it is unlikely that many players are capable of 5bet bluffing in 6max games the 6bet stat is rarely used- although it can show a player’s 4bet fold tendencies. A player with a high frequency of 4bets can mean two things: his initial raising range is far tighter than others and is therefore 4betting for value very often. Or he is 4bet bluffing a higher frequency (most likely with Ace blockers and v players with a high 3B). 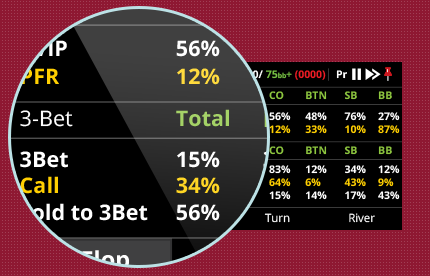 We can use this stat with Fv3B to decide who to 3bet bluff against. This stat is a very strong indicator as to how aggressive a player is. To play a TAG style we should be aiming for 4B stat of 10-15. Our 5b+ stats will differ greatly depending on the types of players in our player pool. This stat tells us with what frequency a player will limp pre flop then come back over the top and re raise when facing a raise. This allows us to determine how strong a range a player is doing this with as it usually suggests a great deal of strength. We can also look at how often they limp call and limp fold to further gain information on their holding. This is not a move that a TAG player should make in cash games much at all- if ever. This stat tells us with what frequency a player will check on the flop, turn or river and then raises our bet. We can use this stat in conjunction with raise CBET to tell how aggressive a player is post flop. We will flop a monster (Set, Straight, Flush Boat etc) approximately 10% of the time so it is fairly common to see a X/R stat of around 10. This is due to players slow playing some of their monsters whilst also semi bluffing draws. If a player has a high X/R they will likely have a higher proportion of semi bluffs in their range. This stat tells us how often someone makes a CBET after 3betting pre flop. 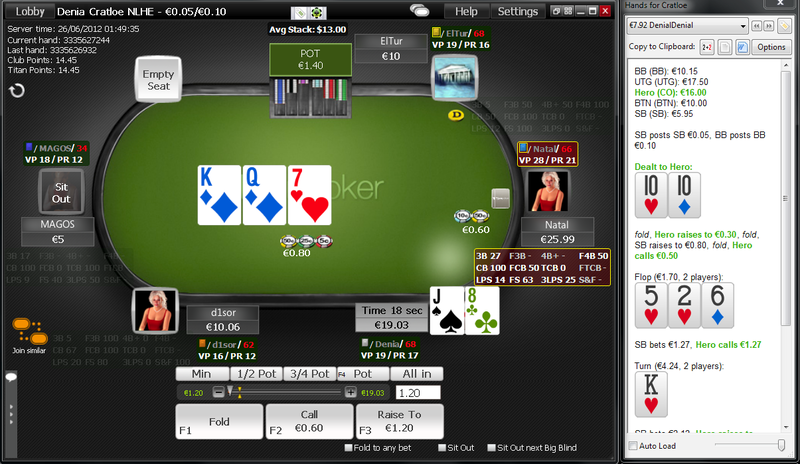 It allows us to see how likely someone is going to continue with aggression post flop and with how wide a range. Most players have a very high CBET3B as their 3bet range is either very strong or they are aggressive. If someone has a wide 3bet range however thier CBET3B should be lower as opponents will realise they have more bluffs in their range. We can float or raise CBET’s in 3bet pots v certain players and be very profitable. There is no exact number for CBET3B to be a TAG player as it depends on our 3bet range, board tecture and villains tendencies. This stat tells us how often someone will fold to a CBET after calling a 3bet pre flop. We can use this to pick on opponents who fold to aggression post flop. This stat combined with Fv3B gives us a very clear idea on a players range. If they have a high FvCBET3B and low Fv3B they are calling 3bets too lightly which we can exploit. There is again no exact number for FvCBET3B to be a TAG player as it is based a lot on player’s tendencies. This stat tells us how likely someone is to make an aggressive play instead of a passive one. If they have an AF of 2 they are 2 times as likely to make a raise as they are to call. This can be misleading as most aggressive players have the lead pre flop and can have an AF of 3+ just by Cbetting a high frequency and never calling pre flop. 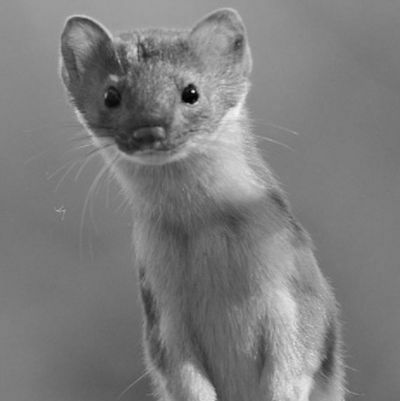 It is however still a very good indicator to how aggressive someone is and therefore the likelihood they will play back at us.